Decorate your life and home with the FYHD Fairy String Lights. Using these cool white fairy string lights to create a joyful, dreamlike and romantic atmosphere for your bedroom. You can put into the jars, hang on the curtain or just put aside the bed. The moldable silver wires easy to mold into any shape you desire. Making the home DIY decor with your children and lover in the spare time. It can be a meaningful and wonderful memory. 2 remote included, one remote can control several lights at the same time. 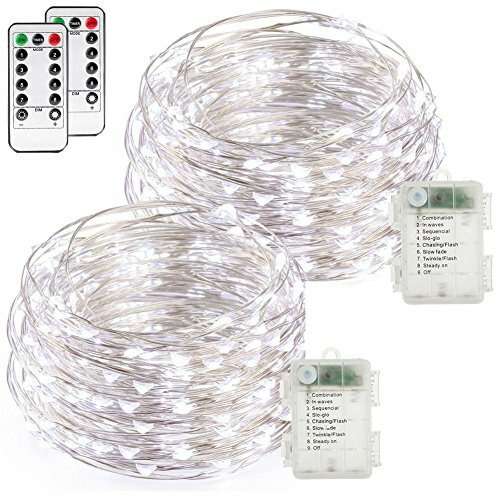 ❤️Remote Controlled: This string lights comes with a remote control that has 13 buttons which include 8 light modes (combination , wave; sequential; slo glo; chasing/flash; slow fade; twinkle/flash; steady )The battery box also one button that can cycle through these different light modes. Other buttons include on, off, timer, and dimming/brightening of the LED's. ❤️What you get: 2 x 16.4ft LED fairy lights, 2 x remote control, 12 month warranty and our excellent customer service. If you have any questions about this product by buways, contact us by completing and submitting the form below. If you are looking for a specif part number, please include it with your message.